Lawns vs. crops in the continental U.S. Your biological clock is ticking. It’s mid-May. You’re looking for the perfect spot, along the river’s edge where the swift, cold water won’t sweep your precious eggs away. You also need some grass, and it must be just the right height. If it’s too tall, your eggs could get stuck; too short, and they could drown. When you finally pick the spot — close to where you hatched a few years earlier — you can only hope the water will still be there when your tadpole children finally emerge from their eggs a few weeks later to make their way into the river. Not all frogs are this finicky. But Oregon spotted frogs need specific types of habitat at different points in their life cycle: dense grasses and shallow water during winter, and deep pools during summer. Decades of habitat loss due to waterfront development have decimated the frog, but the species hangs on in pockets along rivers and in wetlands throughout Oregon and Washington. Along the Deschutes River in Central Oregon, though, the frogs face unpredictable fluctuations in water levels that make it hard to find a reliable spot to deposit their eggs or wait out the winter. Two environmental groups have sued local irrigation districts and the U.S. Bureau of Reclamation, which owns three dams on the Upper Deschutes, in a bid to bring some relief to the frogs and other at-risk species living along the river. A steady, predictable flow is what WaterWatch of Oregon and the Center for Biological Diversity are aiming for. “That’s the habitat the frogs evolved in, and we’re hoping to get a little closer to that,” says Jim McCarthy, a spokesman for WaterWatch of Oregon, a water rights and wildlife advocacy group. And not just for the Oregon spotted frog. “This is an indicator species, it’s not the only species that has serious issues.” If the frogs aren’t doing well, chances are other species are struggling too. The irrigation districts that manage the water on the Upper Deschutes agree, but argue that by taking the fight to save the frog to court, the environmental groups are ignoring eight years of collaboration. In 2008, the irrigation districts, along with federal and state agencies, environmental groups, a Native American tribe and others came together to create the Deschutes Basin Habitat Conservation Plan, a strategy for water management and wildlife protection that governs how water is stored and released. “The Habitat Conservation Plan doesn’t just address one species, it addresses the entire picture,” says ShanRae Hawkins, a communications consultant for the irrigation districts. As drought and quickly melting snow pack become the norm in the West due to climate change, balancing conservation with irrigation will be more precarious. Most of the clashes so far have centered on fish passage around dams, but another frog may soon be joining the Oregon spotted frog in the spotlight. In December, the Center for Biological Diversity threatened to sue the U.S. Fish and Wildlife Service, citing their delay in deciding whether to give the foothill yellow-legged frog, another species they say is affected by unreliable water releases from dams, the protection of the Endangered Species Act. 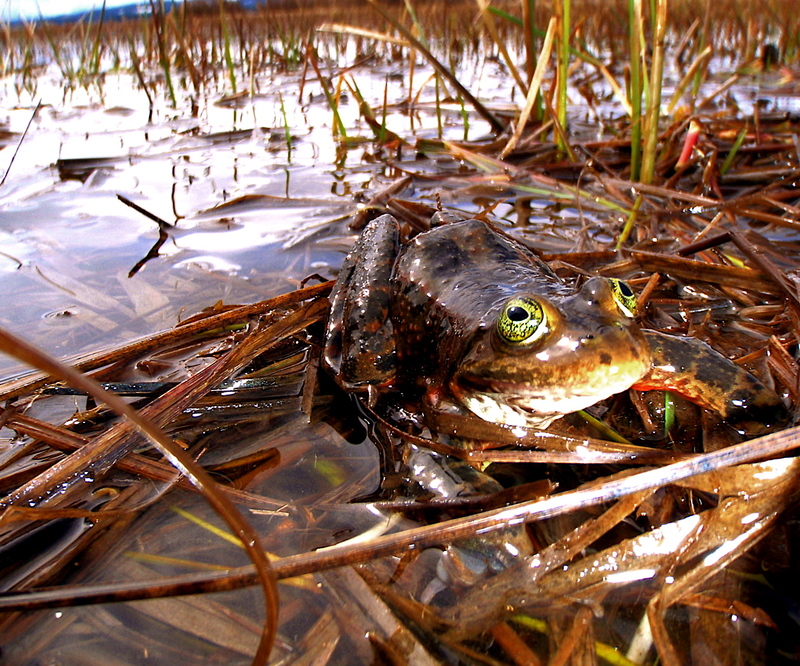 Oregon spotted frogs were once found in wetlands and rivers from British Columbia to Northern California. But the species is in sharp decline, mostly because of habitat loss due to land development and from the interference of invasive species, such as reed canarygrass and American bullfrogs, according to Lynch, the government biologist. Changes in water management, pollution and climate change all have an impact, too. The frogs were officially listed as threatened under the Endangered Species Act in 2014, and the federal government designated critical habitat areas in early May 2016 where development and irrigation will be limited. “They’re the areas that are essential for the conservation of the species,” Lynch explains. Over 65,000 acres in Oregon and Washington are now considered critical habitat for the frogs, including public lands along the Deschutes River. When it built two dams on the Deschutes in the 1930s and ‘40s, the U.S. Bureau of Reclamation was not thinking about frogs. Farmers needed water to continue growing clover and wheat in an area that typically gets less than 12 inches of precipitation each year. Irrigation districts were established to draw water from the river and reservoirs created by the dams, and to manage delivery to farmers through a system of canals and pipes. The irrigation districts start diverting water from the river and reservoirs in spring, peaking at the height of summer. The dramatic changes in water levels were ideal for farmers, but not frogs, as the U.S. Fish and Wildlife Service noted in a 2013 analysis. “People have thought, ‘we can run it like a spigot and we can turn it on and off’,” says WaterWatch’s McCarthy. The collaboration that brought about the conservation plan came to an end in December when the Center for Biological Diversity filed its lawsuit and WaterWatch followed with a lawsuit of its own. The lawsuits took the irrigation districts by surprise. “They thought they were all together, and working in lock-step together,” says Hawkins, the districts’ spokeswoman. She points out that the water release the environmental groups asked for would have cut off nearly all water in the coming year to the North Unit Irrigation District, where about half the world’s carrot seed is produced every year and where farming is an industry worth about $750 million. At a hearing in late March, a federal judge decided against releasing water on a schedule that might be better for frogs but worse for farmers. Instead, the judge urged both sides to come to an agreement in mediation. It’s possible to take steps to improve their habitat even without reliable data on how much water the frogs need, according to Lynch of the U.S. Fish and Wildlife Service. She points to Trout Creek Lake in Washington state as a good example of land management with frogs in mind. When Washington’s Department of Natural Resources took over the property, they had to restore an area that had been diked and ditched for irrigation. The department replanted native species and kept grass by the creek at just the right height for the frogs, both by mowing and allowing cattle to graze the area. Maintaining a mix of habitat types, especially breeding habitat, throughout the year is also important, according to Lynch. Kelsey R. Kennedy grew up on a tree farm in Oregon’s Coast Range, roaming through the forest and reading everything about science she could find. She took the scenic route through undergrad, switching schools and majors, and ended up with a B.S. in economics and a minor in actuarial science from Oregon State University. When she’s not reading or writing about science, she’s probably wearing hiking boots, tinkering with a camera and planning her next adventure.